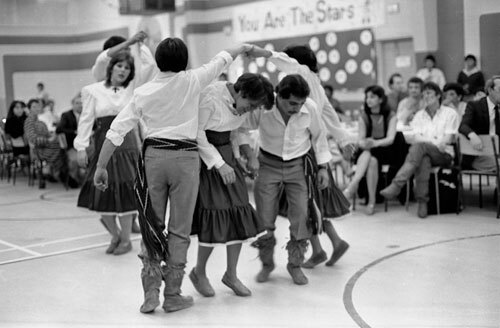 This celebratory gathering of Indian and Metis graduates from Saskatoon collegiates was put on by the the Saskatoon Indian and Metis Friendship Centre, 1985. The concept of Friendship Centres originated in the 1950s with the increasing numbers of Aboriginal people moving into urban areas. The centres were created within urban settings as a way to address the needs of Indian and Métis people at the local level, providing referrals and counseling with respect to employment, housing, Education, health, and liaison with other community organizations. Saskatchewan currently has thirteen Friendship Centres, with a corporate office in Saskatoon. The Centres fall under the administration of the Aboriginal Friendship Centres of Saskatchewan, which is controlled by a board of directors consisting of two representatives from each Centre and an elected executive committee. The mission of the Centres is to provide access to Elders and help Aboriginal people through friendship, harmony, cultural integrity, awareness, and sharing. The present Friendship Centres in Saskatchewan are the following: Battlefords, Buffalo Narrows, Ile-Ã -la-Crosse, Kikinahk, La Loche, Moose Mountain, North West, Prince Albert, Qu'Appelle Valley, Regina, Saskatoon, Sipisihk, and Yorkton.